McAllen Victoria Sola gestures to referee after she was called for a push off against Houston Memorial during the 2nd half of the Class 6A state semifinals at Birkelbach Field Friday, April 20,2018 in Georgetown, Texas. Houston Memorial defeats McAllen 2-0. GEORGETOWN — The McAllen High Bulldogs listed a strong start as one of the keys entering their Class 6A state semifinal match against Houston Memorial. 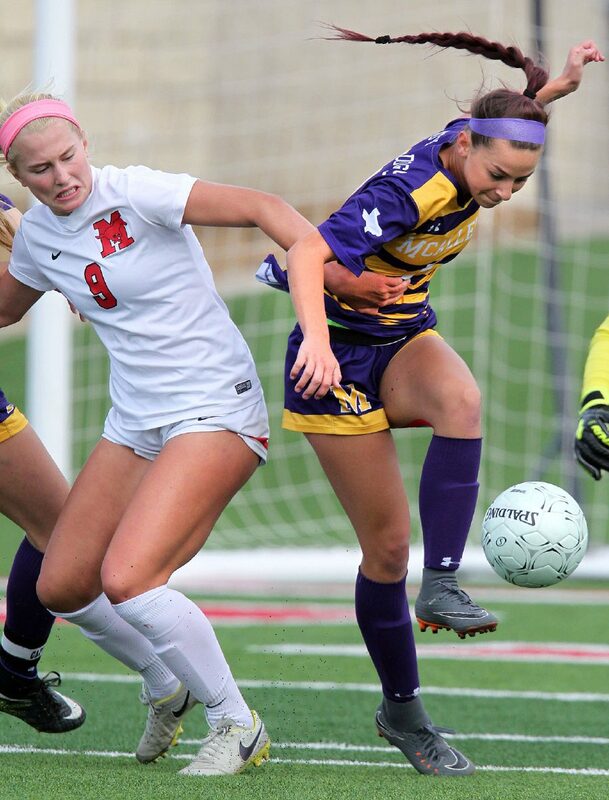 But the Memorial Mustangs were the ones who scored the early goal, which stood as the winner in the 2-0 final Friday morning at Birkelbach Field. The opening tally came just 38 seconds into the match, on a rising shot from Grace Yochum over the reach of McHi keeper Lexi Gonzalez. 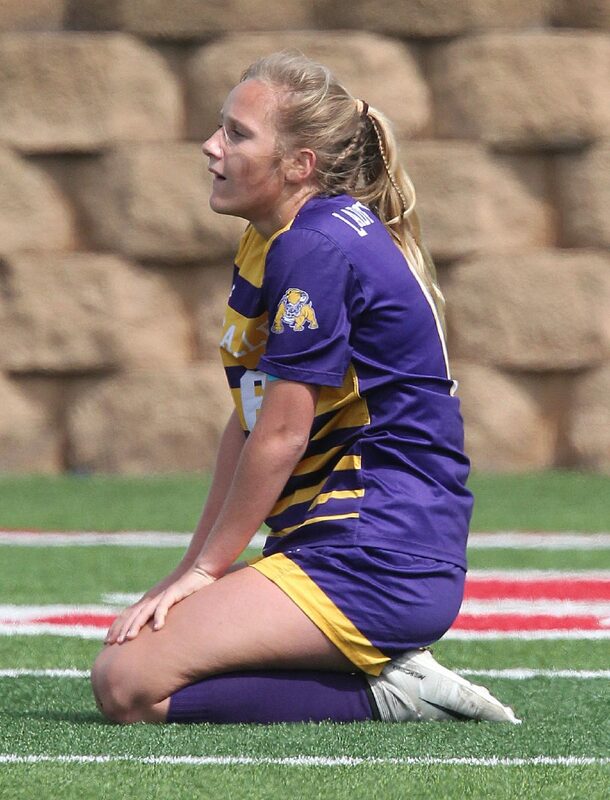 McAllen Westyn Henderson misses a goal against Houston Memorial during the 2nd half of the Class 6A state semifinals at Birkelbach Field Friday, April 20,2018 in Georgetown, Texas. 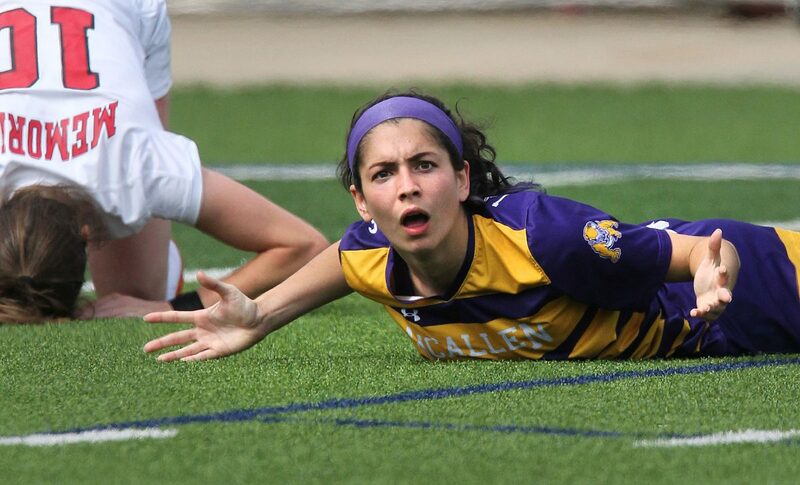 McAllen Jackelyn Lemus reacts to an attempted goal against Houston Memorial during the 2nd half of the Class 5A state semifinals at Birkelbach Field Friday, April 20,2018 in Georgetown, Texas. 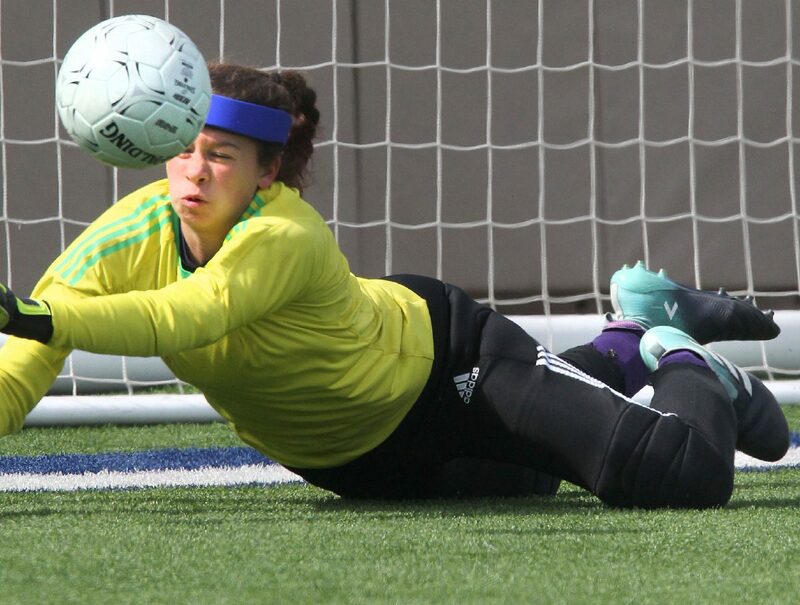 McAllen Lexi Gonzalez with a save against Houston Memorial Grace Collins during the 2nd half of the Class 5A state semifinals at Birkelbach Field Friday, April 20,2018 in Georgetown, Texas. 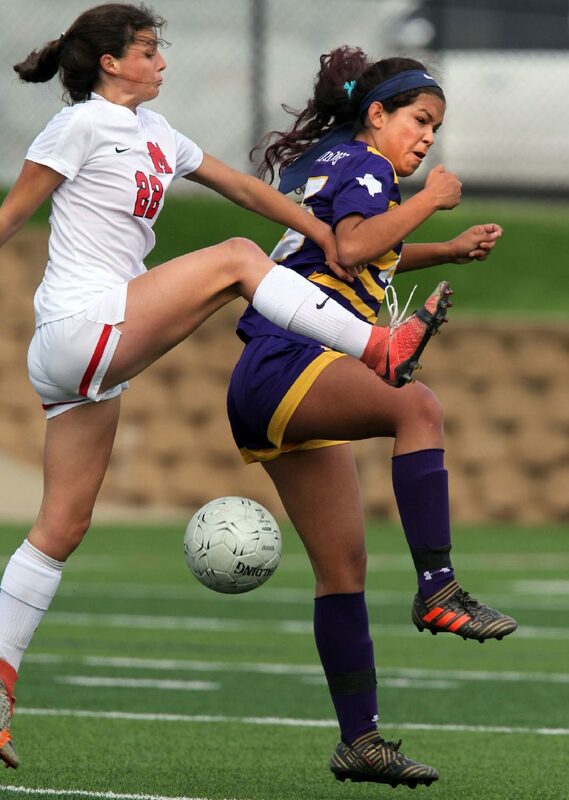 McAllen Jackelyn Lemus battles for postion against Houston Memorial Kelsey Hranicky during the 2nd half of the Class 5A state semifinals at Birkelbach Field Friday, April 20,2018 in Georgetown, Texas. 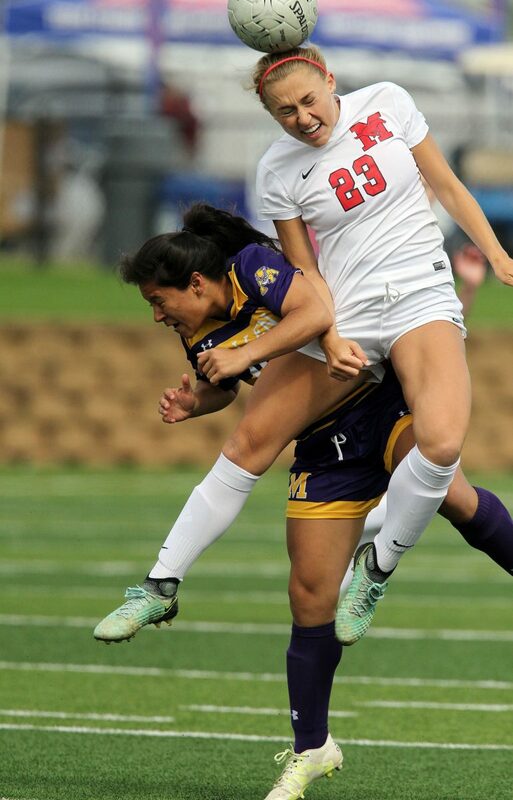 McAllen Victoria Sola with a header against Houston Memorial Alina Khan during the 2nd half of the Class 5A state semifinals at Birkelbach Field Friday, April 20,2018 in Georgetown, Texas. McAllen Zoe Flores fronts Houston Memorial Grace Collins during the 2nd half of the Class 5A state semifinals at Birkelbach Field Friday, April 20,2018 in Georgetown, Texas. 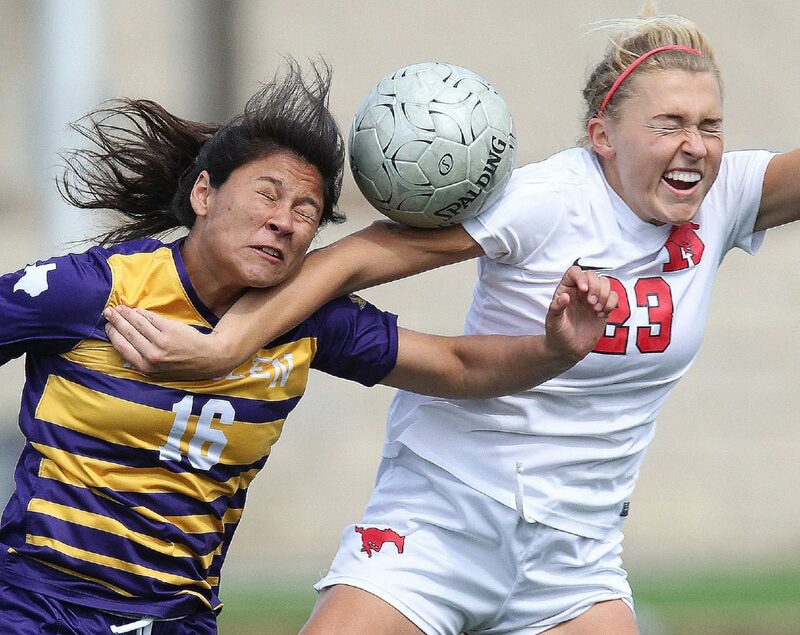 McAllen Serena Cervantes collides with Houston Memorial Addie Gaetano during the 2nd half of the Class 5A state semifinals at Birkelbach Field Friday, April 20,2018 in Georgetown, Texas. 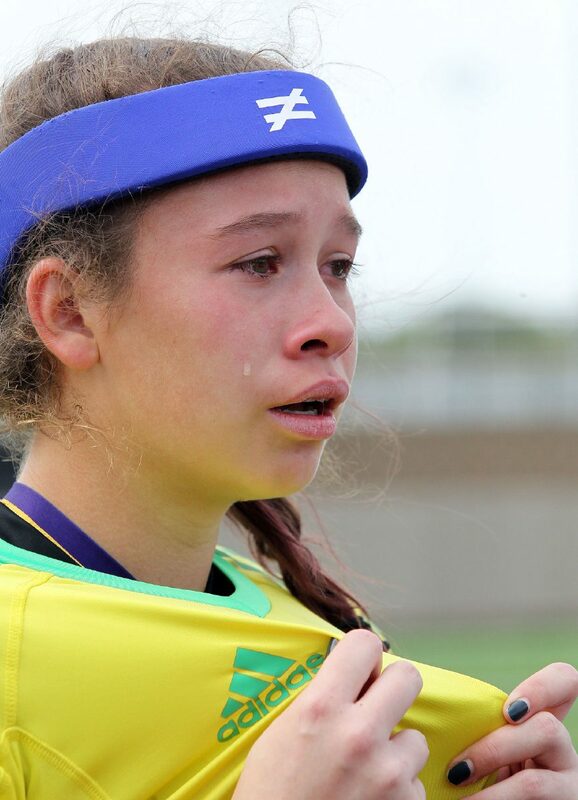 McAllen Lexi Gonzalez cant hold back tears after their loss to Houston Memorial in the Class 5A state semifinals at Birkelbach Field Friday, April 20,2018 in Georgetown, Texas. McAllen fielded an extremely young squad loaded with underclassmen who are set to return next season. The seniors on the team said they were happy to be a part of the group, which became the first Valley girls team in history to advance to the state tournament. Lemus, Victoria Sola, Serena Cervantes, Paola Perez and Priscilla Cantualla will graduate this year. Hannah Kelly, Emily Gurwitz, Lemus and Sola were again solid defensively, just as they were on the Bulldogs path to the state tournament. After the initial strike, the Mustangs didn’t muster many opportunities on net. Instead, they were content to maintain possession and force McAllen to play long passes. 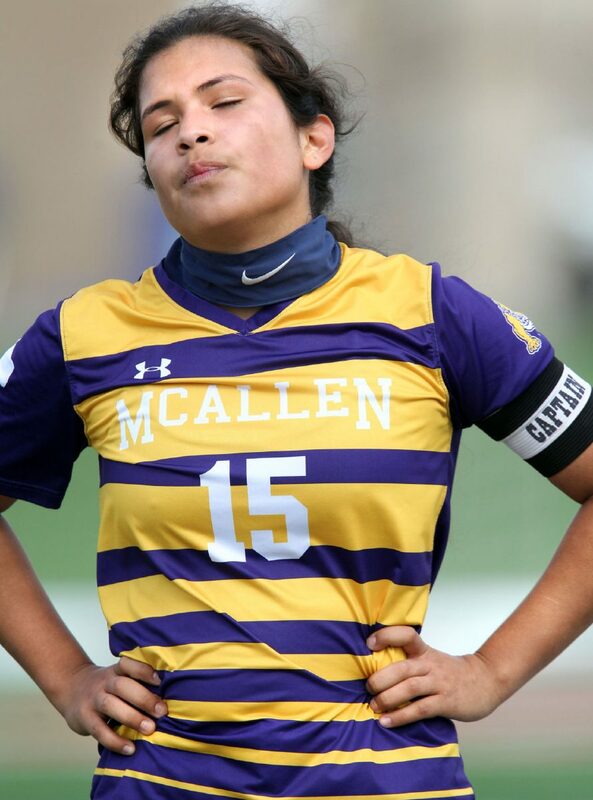 Sophia Soto was the primary target for McHi’s attack, and she often used her speed to beat the first defender, but Memorial was typically quick to recover and pressure the ball away. 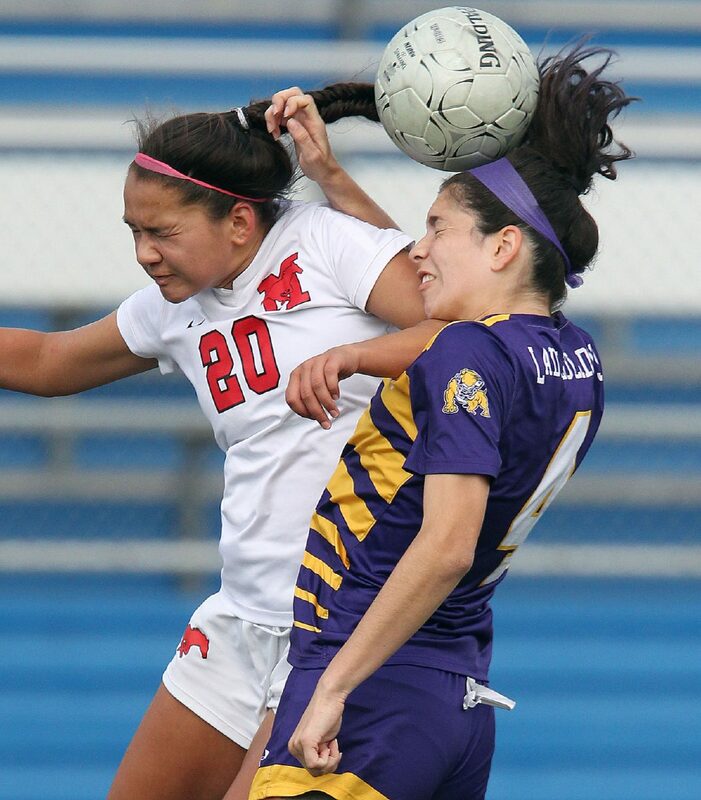 The Bulldogs’ best opportunity came in the 21st minute, when a centering cross reached the head of Mireya Ramirez. The 5-foot sophomore headed the ball just high of the crossbar, and the chance ended on top of the net. After that play, threats were few and far between for McHi. Memorial was strong on the ball in the second half, rarely surrendering possession and not giving McHi a clean look at the net. During the final five minutes of the match, Memorial doubled its lead with a shot by Alina Khan, sealing the win and advancing the Mustangs to their first state championship match. Friday’s victory marked their 21st shutout of the season. After the game, Arney caught up with former players from his 22-year tenure at McAllen High. He met with players from his first team, his first regional qualifying team and his 2007 group that advanced to the regional finals — previously the deepest run by a Bulldogs squad. Lemus had bittersweet feelings about coming up short on Friday, but she was glad to leave a mark on history.